Arts editor Kay Kipling takes in an opening night performance of RIAF 2015. Each year, the Ringling International Arts Festival proves that the arts truly are a universal language. Based on the opening night performance I viewed, by Phare: The Cambodian Circus, that remains true at the 2015 fest, which bears an Asian theme for the first time. You don’t have to know anything, really, about Cambodian culture to follow the storyline of Khmer Metal, the piece the circus performs here. Just don’t go expecting traditional art forms, tastefully and modestly executed. Khmer Metal is in-your-face and contemporary, and the more exciting for it. Khmer Metal starts rather slowly, with a darkened stage barely illuminated by a flashlight wielded by one of the performers entering the set—a grungy bar in Phnom Penh. There’s a leftover drunk rolling around the floor (turns out he’s the bar’s bouncer), whom the bar owner (played by the show’s creator, Chanthoeun Nem) tries to rouse in order to begin another night of business. Gradually, the show’s musicians—two females and one male, who play a variety of instruments, including a car door!—enter, and the night’s events begin to unfold. There’s a great deal of humor in the construction of Khmer Metal, as well as some driving music, incredible energy from the young cast (graduates of the Phare Ponleu Selpak Circus School in Cambodia), and, of course, some very impressive acrobatic feats. 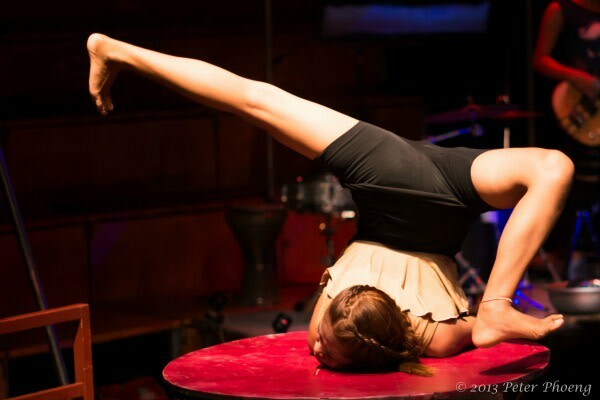 Everything from hand balancing to juggling to balancing on a skateboard placed atop other moving objects to combinations of dancing/fighting is utilized to round out the evening of constant one-up-man(and woman)ship. And the music—often a sort of Khmer hip-hop—by composer Sothan Kheav practically demands that the audience members get up out of their seats and dance with the performers. After the show, dancing is exactly what many attendees of the Bollywood Dreams opening night party in the museum’s courtyard did, faithfully following the example of the entertainers onstage before the statue of David. Asian bites and, naturally, a fireworks display were also part of the party. RIAF continues through Sunday in various theaters at the Ringling/Asolo Rep complex; go to ringling.org for complete info.